Zambia is in central southern Africa. We flew there from Portland, Oregon to Amsterdam to Lusaka (Zambia's capital). The next day our six-member, Natural Habitat group flew northward to Mfuwe in South Luangwa National Park. Our safari began with three nights at Kuyenda Bush Camp hosted by the legendary guide Phil Berry and his dedicated and delightful companion Babette Alfieri. Phil's encyclopedic knowledge of the local wildlife and pioneering expertise in leading walking safaris and in navigating game drives both day and night plus Babette's skill in crafting a luxurious experience for guests in a remote bush camp made this our perfect first-safari adventure. On to Kapamba Bush Camp for two nights, one night at Mfuwe Lodge, and three nights at Busanga Bush Camp in Kafue NP. The safari ended in Livingston overnight at Toka Leya Camp on the Zambezi River followed by a guided tour of Victoria Falls. 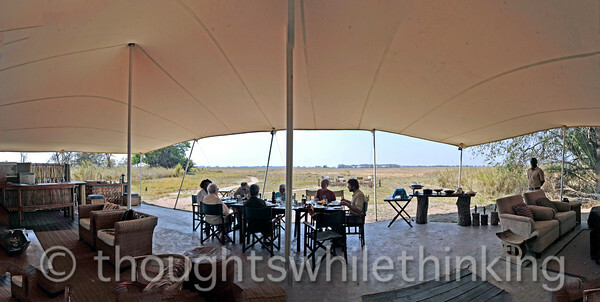 Lunch under a panoramic canvas at Busanga Bush Camp in Kafue NP.